As a soloist, pianist Hao Zhang has performed a wide range of solo music at Zhejiang Conservatory of Music, playing repertoires ranging from Debussy’s Bruyeres to Bach’s English Suite no.3. Zhang also worked part-time in a music institution for more than one year and taught students in junior high school during undergraduate. What this experience offered, was the realization of the responsibility as well as the joy being a teacher can bring. 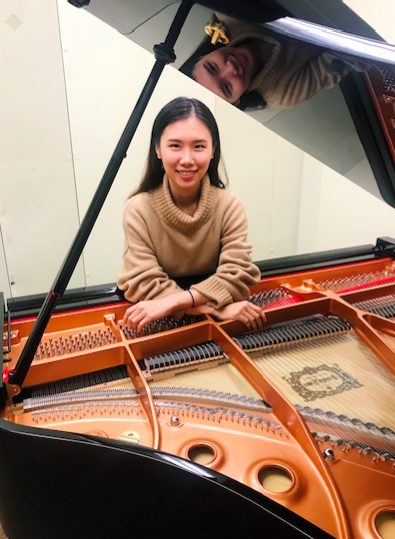 Driven by her deep interest in piano performing, Miss Zhang is currently attending a Master’s program in piano performance in Boston University, where she studies under the guidance of Boaz Sharon and Roberto Plano. Miss Zhang received her bachelor’s degree in music from Zhejiang Conservatory Of Music. She has studied privately with piano artists Min Yue, Huazheng Ji and Steinway Artist Ting Zhong.